CHOO! CHOO! Birthday train coming through! 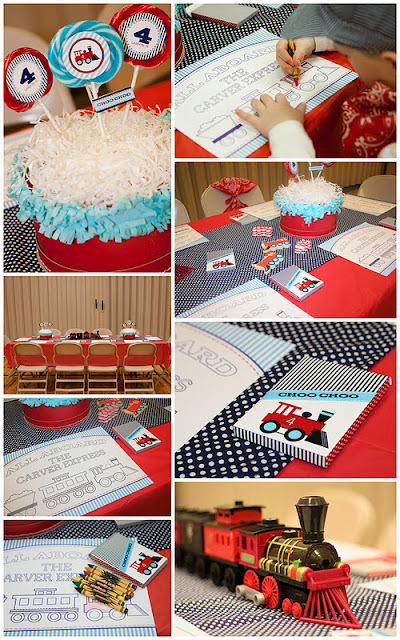 The next feature goes to this adorable 4TH BIRTHDAY TRAIN PARTY submitted by Jennifer Carver of Banner Events. Jennifer is SO talented. Her parties are always so fun to look at. 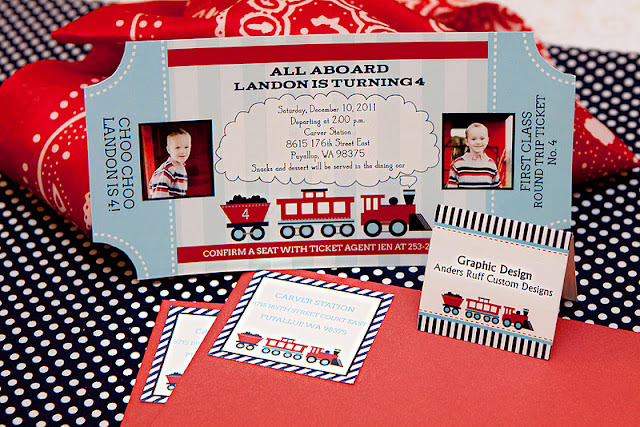 "When my son Landon begged us for a train-themed party to celebrate his 4th Birthday in December, I immediately contacted Maureen of Anders Ruff, knowing she would design the perfect choo choo train themed printable package to tie the various elements of our event together. I was right! Maureen delivered in a big way! I am thrilled to share with you the resulting party, photographed by my friend and talented photographer, Rebecca Pierce of Mi Vida Photography. 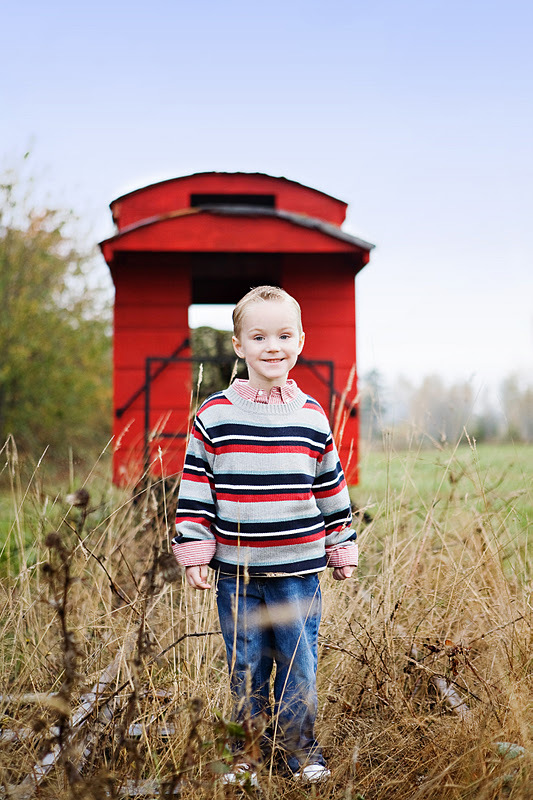 Another talented friend, Karina Rigtrup, of A Fresh Take Photography offered to take pictures of my little train-loving boy to use on the invitations and as part of the party décor. I knew the stars had aligned when we showed up to the photo shoot and the old vintage train matched the colors in the printable package Maureen was customizing for us! 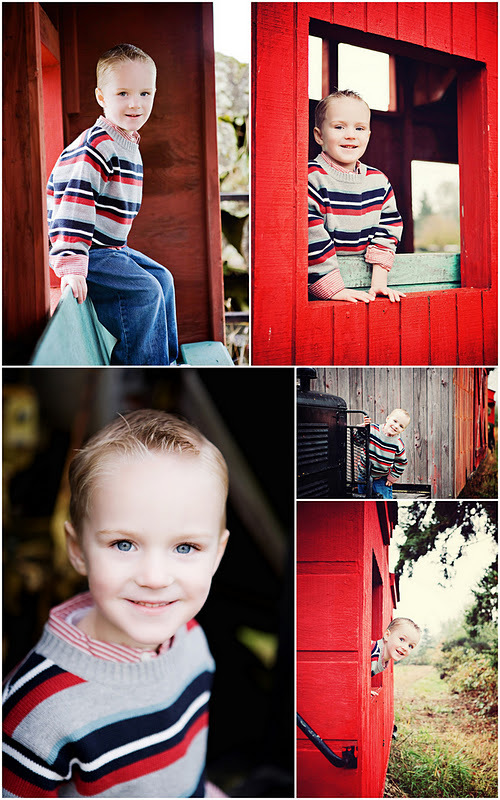 It was such a special day for him getting to board a REAL train. All Aboard/The Invitation: The darling invitation choo choo'd it's way to each guest's home inviting them to join us at Carver Station and hop aboard the Carver Express for an unbelievable party. 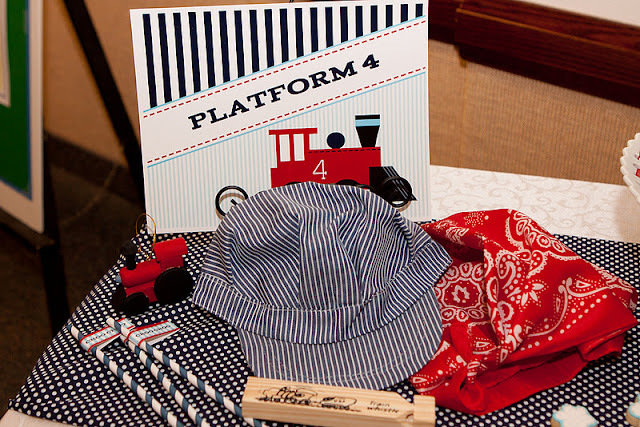 Engineer Outfits: The kids loved the train ride that dropped them off at the dining car, where the Chief Engineer (me!) helped get them outfitted to properly ride the rail. A striped engineer hat & red bandana were adjusted to fit each little guest. 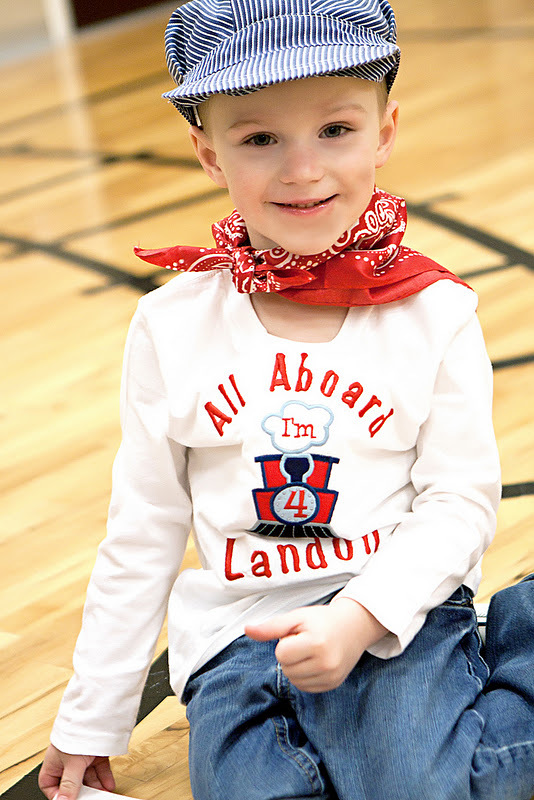 Landon had a special shirt designed for him by Lisa of Bella Bean Gifts. Her custom appliqué work was fabulous, and she is so great to work with. Lots of fun designs can be found in her Etsy store. 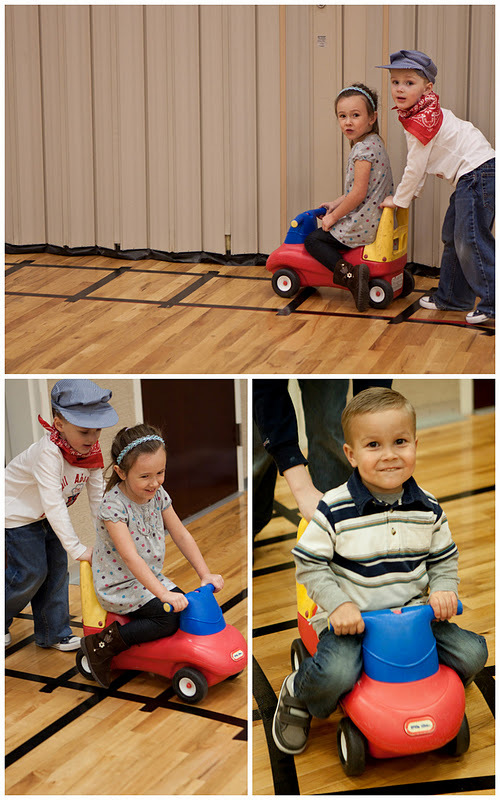 Party Activities: After being properly outfitted, party guests had a number of fun activities to choose from. They could put together oversized train puzzles on the floor. (Thank you Anders Ruff for creating these upon my request!) I made the puzzles by printing them out on glossy 11x17" sized paper at Staples, cutting them into puzzle pieces and then running them through my laminator. 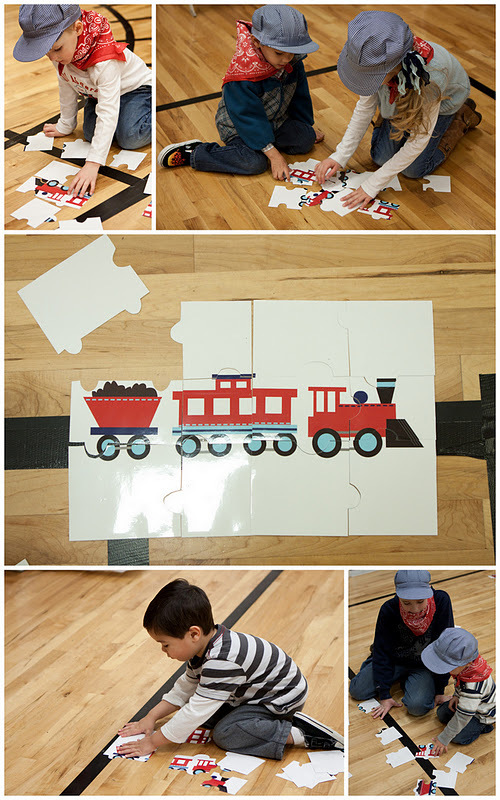 There were several puzzles so that many children could do this activity at the same time. The Dining Car/Snack Time: Who knew little engineers could work up such an appetite? It's a good thing the Carver Express was serving snacks in the dining car. Guests enjoyed sitting down to refreshing Chugga Chugga water. I love how a simple beverage wrap can add so much pizzazz to a basic place setting. Of course, it's way more fun drinking out of stripey straws. Polka Dot Market contributed the darling engineer blue (navy) striped straws which I adorned with cute little printable party flags from the AR collection. Knowing I needed a creative container to house fruit snacks and crackers, I had Maureen custom design a fry container for each child. Aren't they adorable? With a little tissue paper fringe attached, the festive look was easily achieved. 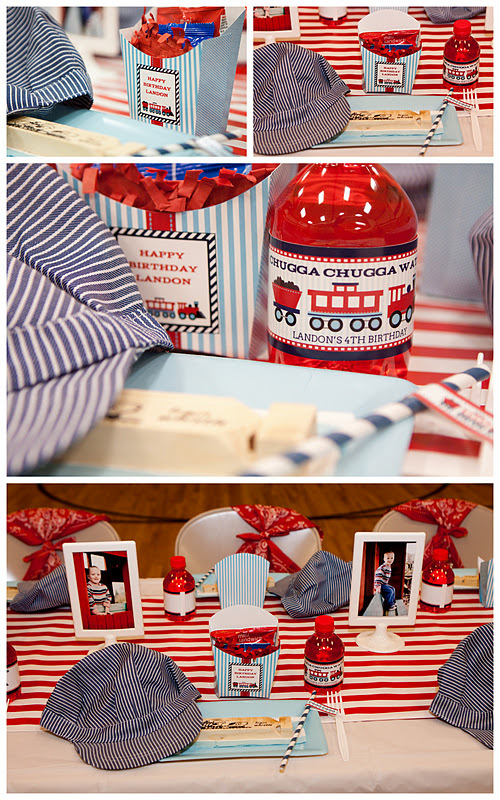 I kept the dining car simple with a red/white striped runner, more DIY train cars that acted as balloon weights and framed pictures of our birthday boy riding the train. 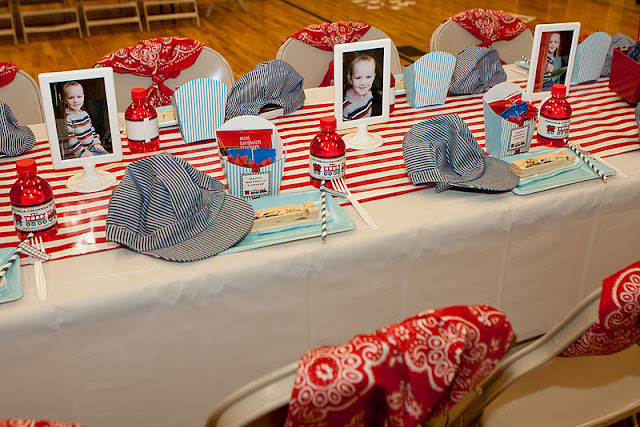 The chairs were dressed up with the red bandanas that each child claimed upon arrival. Place settings consisted of a conductor hat, train whistle, fry box filled with snacks, party straw and flavored water. Dessert Table Highlights: Of course, the focal point of a birthday party (besides the guest of honor) is the dessert table! 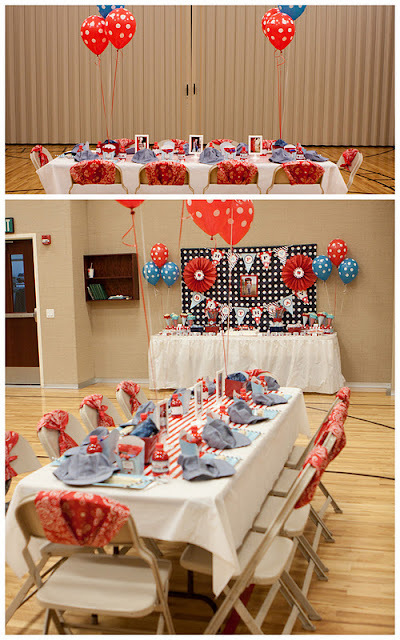 The color scheme of our event was navy blue, red & light blue. 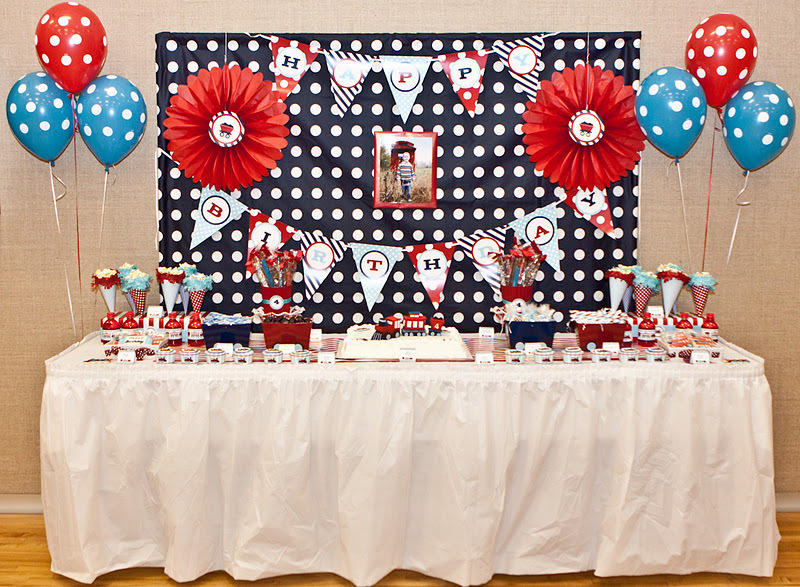 Red tissue paper fans & red & blue polka dot balloons from Polka Dot Market combined with the colorful striped & polka dot banner included in Anders Ruff's printable package provided an eye-catching backdrop for the table. An inexpensive red & white striped tablerunner was created from wrapping paper! (I continually remind myself that parties don't have to be expensive! Reduce, reuse, recycle!) And, the table was literally littered with almost a dozen scrumptious desserts. The cake & cupcakes: Brittany, of Edible Details always does such beautiful fondant work. 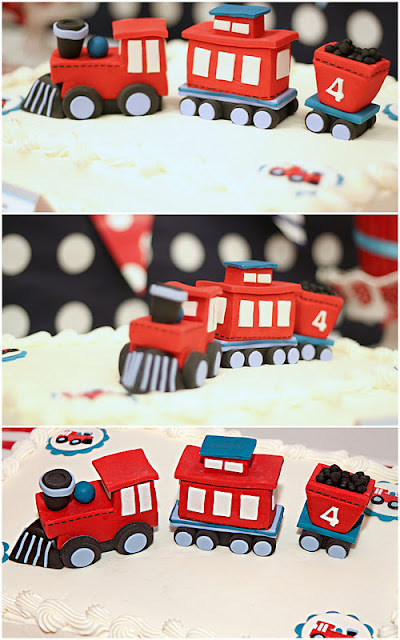 She customized the adorable 3-D fondant train topper and cupcake toppers to match the cute train designed by Anders Ruff on the coordinating printables. If it's possible for something to be 'too cute to eat', her fondant masterpieces would definitely qualify! The Cake: Don't you just love the train chugging across the cake? If you aren't a master cake decorator and hiring a bakery to make a custom cake isn't in your budget, a less expensive alternative is ordering a plain white cake from Costco or a local grocery store and adding custom fondant designs, like those seen here from Edible Details. The Cupcakes: One of my favorite party details is the cupcakes! 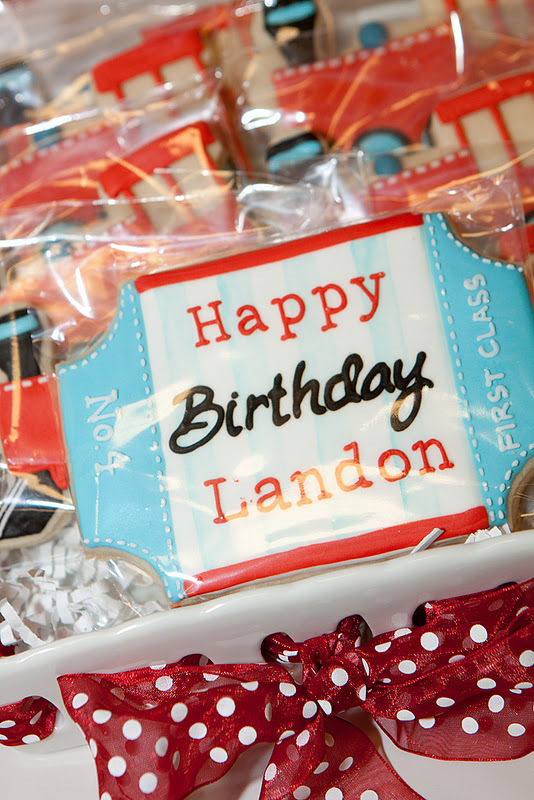 I asked Anders Ruff to add a custom designed cupcake wrapper with my printable package. 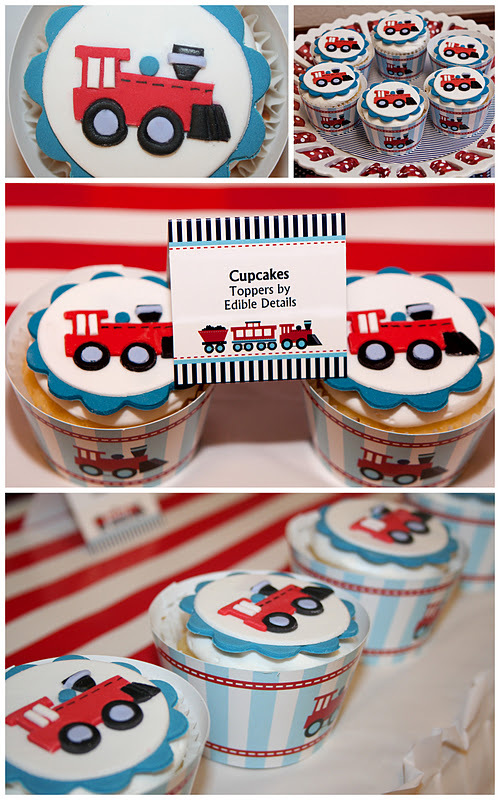 Paired with the darling fondant train toppers, they added so much color to the dessert table. Custom Train Cookies: Becoming acquainted with talented dessert artists from all over the country is one of my favorite parts about styling parties. Liz, better known as" Arty McGoo", does stunning work! Her attention to detail was amazing. 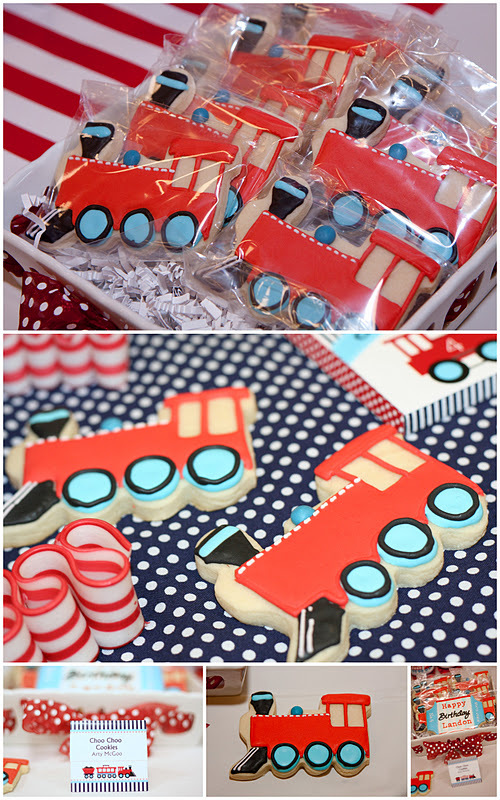 Not only were the train cookie favors precious, they were equally delicious (I snuck a few nibbles!) and came individually packaged to ensure freshness & easy distributing. 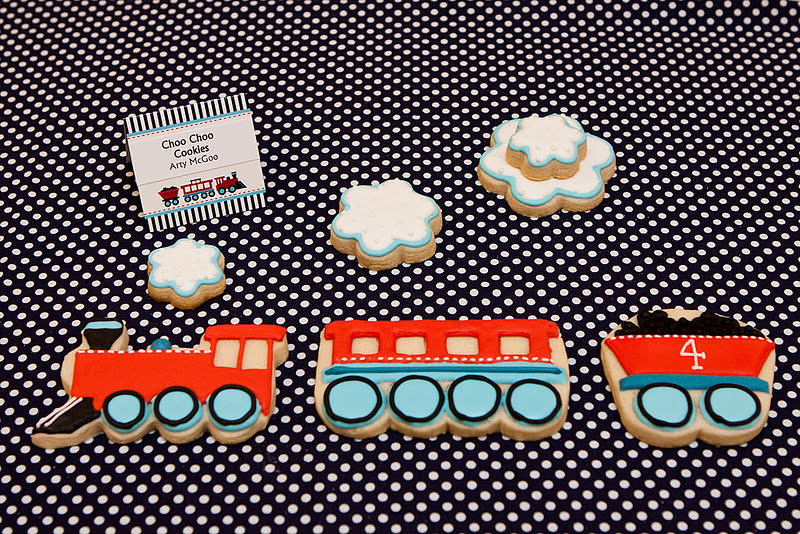 The little engineers had so much fun moving their cookies around, chugging them along imaginary tracks before taking their first mouth-watering bite! 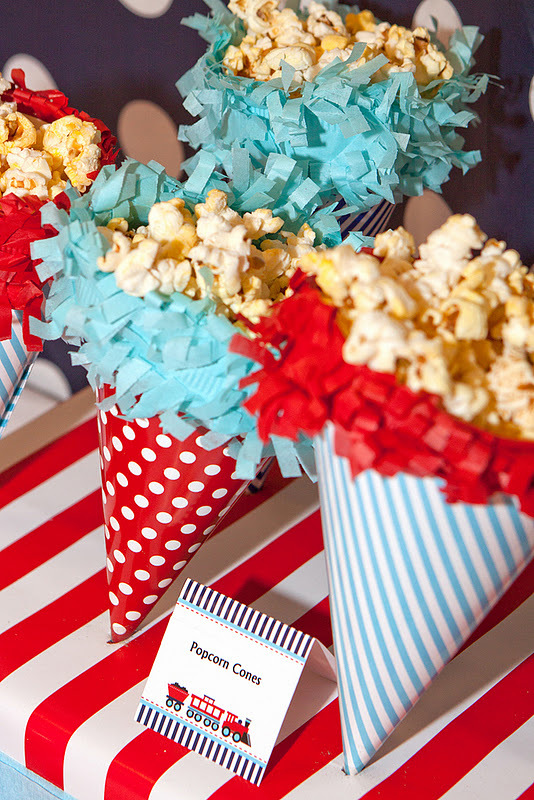 Popcorn Cones: My son is a self-proclaimed popcorn addict, so it was only fitting to request that Anders Ruff design popcorn cones for this event! 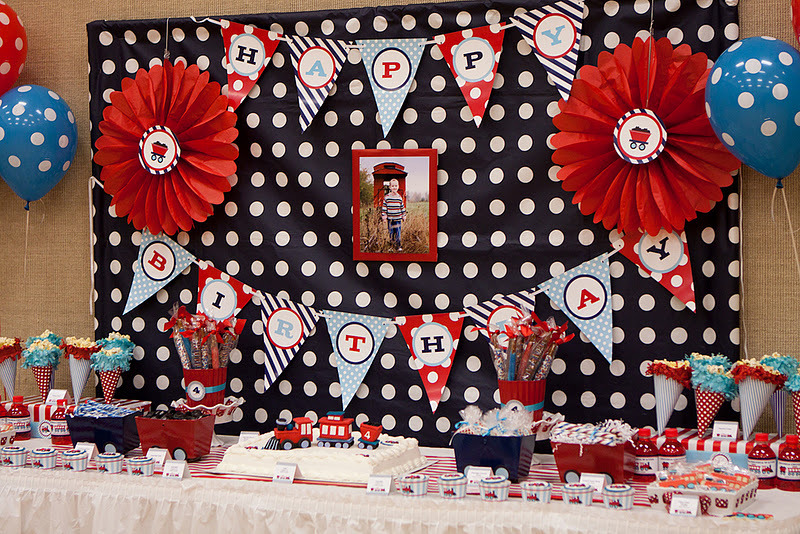 I just love the striped and polka dot patterned paper. Simply print the template & cut! They were so easy to assemble. Tissue paper fringe, from Polka Dot Market was added to the top for extra cuteness! 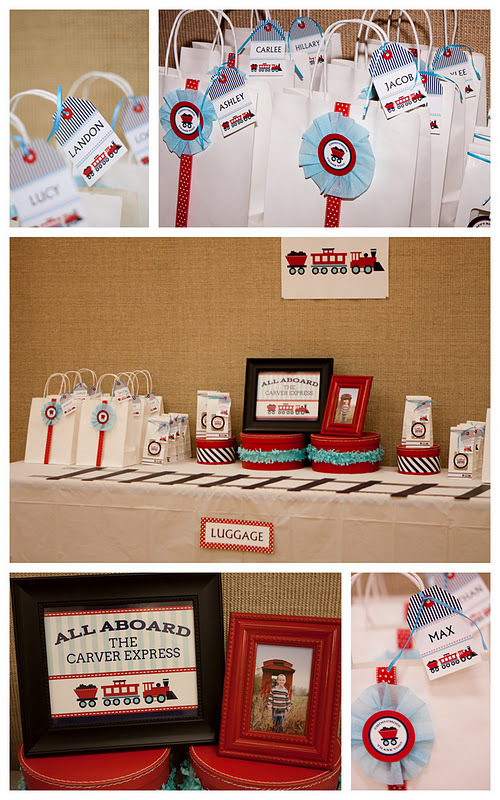 Party Favors: A custom luggage tag was attached to gift bags embellished with tissue paper rosettes, a ribbon sash and Anders Ruff party labels. The bags sat atop our 'Luggage' table. Each attendee took home the bag full of their train whistle, conductor hat & bandana. 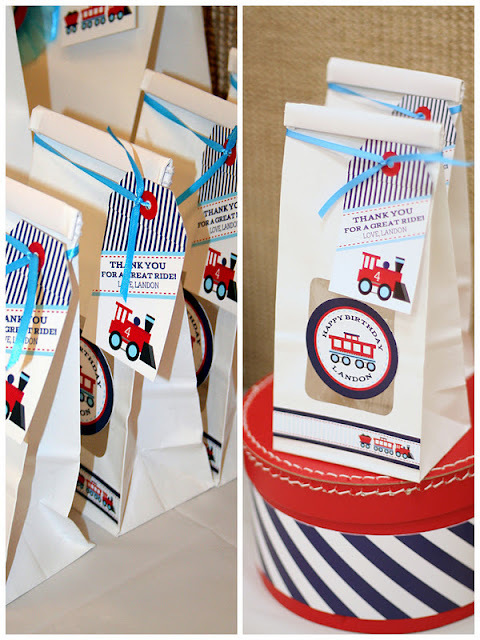 In addition, goodie bags (clear white window bags from Nashville Wraps), decorated with more coordinating printables from Anders Ruff were lined up on the train track-covered table. Guests filled up their bags with sweets from the dessert table for their journey home."